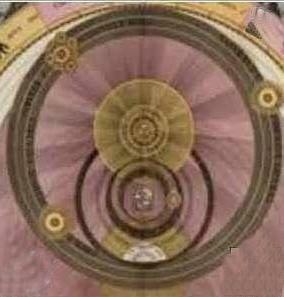 Dorotheus was the first Hellenistic author to use the planets´ triplicities to give signs of events. Other authors before him, without exception, used only the triplicity of the luminary of the sect as part of a specific technique: assessing the eminence of the chart. In addition to that, Hellenistic astrology pre-Dorotheus did not divide life into three phases, but two, whose border was unclear: the first lord of the triplicity, depending on whether the nativity was during the day or night, ruled the first half of life, while the second lord ruled the second half. The third lord of triplicity acted throughout life as a participant along with the other two. Based certainly on Dorotheus, subsequent authors extensively used the lords of triplicity of each house and used them as giving signs of the three parts of life. Generally, each ruler of the triplicity relates to a time period of approximately 1/3 of life, namely between 25 and 30 years. All we know about Al-Andarzaghar and his triplicities rulers is based in Al-Qabisi´s work translated into English from Arabic and Latin by Charles Burnett, Keiji Yamamoto and Michio Yano. He provided a different meaning for each triplicity ruler of any house and therein lies its uniqueness. But Bonatti and certainly Robert Zoller understood the use of the technique in a more complex way. This article has the purpose to investigate what exactly is known of Andarzhagar by citing Al-Qbisi, which ideas about triplicity he spread and why an eminent author such as Bonatti deduced that each meaning of a triplicity ruler had to be circumscribed only to a third of life. First, one may wonder what was the reason why Al-Andarzhagar found that a new system should be developed, that is, giving each triplicity ruler significance. It is true that there are many meanings associated with each house and, therefore, the information on different themes should be often drawn from the same planetary significators. This may cause some problems, but nevertheless it is possible to avoid inconveniences if the astrologer employs a second range of significators. These could be planets with natural association with the theme or any lot. Both solutions have been widely used in the Hellenistic period. However, Al-Andarzaghar seems to have found it necessary to link a meaning to each of the triplicity rulers. From then on, that is, from what Alchabitius reports, it represented a new step to extend the significance of each triplicity lord to certain time, that time being a third of life. Thus there was a mix between the concepts of Dorotheus, linking the triplicity rulers to a time of life and those of Andarzhagar, linking each ruler to a meaning. This hybrid form appears in the text of Bonatti and very clearly in the interpretation of the contemporary Latin scholar Robert Zoller. Thus in the case of House 4, for example, Andarzhagar says that the first triplicity ruler represents the parents, the second represents lands and the third, the end of things. Both Bonatti, which was based on a citation by Alcabitius, and Robert Zoller, based on Bonatti, understand that the first triplicity ruler of the 4th House represents the father in the first part of life. As Andarzhagar assigns the second triplicity ruler to the subject lands and cities, such planet would give testimony of this issue in the second part of life. As to Andarzhagar, the third triplicity ruler of the 4th House represents the end of things and prisons they seek testimonies of such things in the third part of life. Now, in the case of the 8th House, since for Alezdegoz or Andarzhagar it represents death in the first part of life, old things in the second part of life, and what is inherited from the dead on the third part of life, how do we understand death in the third part of life? On the other hand, as we will see ahead, in Alchabitius’s text there is nothing that leads us to admit that Andarzhagar has delimited the meaning of each triplicity to only a third part life. The idea is, in my view, derived from a corruption of Alchabitius’ text. In order to exemplify the technique suggested by Bonatti and Zoller, I shall give a practical example through which we can perceive how the delineation will be limited if each stage of life is referred to one triplicity ruler. To make use of the technique, it is necessary to observe if the nativity is diurnal or nocturnal. In the case of a diurnal nativity, the first third of life would be ruled by the first lord of triplicity, the second third by the second lord and the last third by the third lord. The opposite happens if the nativity is nocturnal, when we would begin by the second triplicity ruler, and then would use the first ruler and, lastly, the participant ruler related to the third part of life. So far, nothing differs from Dorotheus. 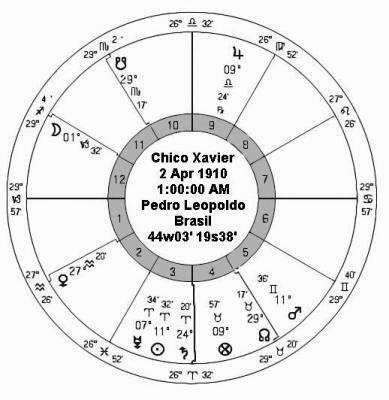 The astrological chart above belongs to one of the most highly regarded Brazilian mediums, a person who had many health problems, was practically blind, especially in the latter part of life, psychographed numerous letters and books dictated by entities and is considered by many a true saint. As it is a nocturnal nativity, in the first part of life Jupiter will be the ruler because it is the lord of the nocturnal fire triplicity (Aries in the 4th House). Jupiter is a benefic in the 9th House by division and in the 10th House by whole signs, but it is retrograde and tending to cadence. Therefore, we say that parents (we are delineating the 4th House) did not represent a positive experience in the first part of life. The second planet that gives testimony to the 4th House in the second part of life is the Sun, the second ruler of the nocturnal triplicity. The Sun is cadent by division and by whole signs is in the 4th House, an angular house. Being essentially dignified, it can moderately supply issues that concern land (“the second, countries and lands“). In the third part of life (the third<refer to>outcomes of the matter and prison), Saturn is the ruler: Saturn is strong by house, it is angular, but is in its fall, therefore the third part of life regarding the end of things and prisons means that there will be many problems, because Saturn has dignities in 1-the 12th House, where the Moon is, 2-in the Ascendant and 3-in the 2nd House. Being the cusp in Virgo, in the first part of life, the Moon is the ruler. It indicates limitations since it is in detriment and by division in the 12th House: travel is not a part of the native’s life in the first part of life. In the second part of life, Venus is the ruler, and since it is in the second house, a productive house, we see that religion and religious observance, as well as eminence, is achieved, but because Venus is under Saturn’s domain which is in the 4th House, this eminence occurs within the family and does not last long, because Saturn promises more than it can deliver; in the third part of life Mars is the ruler and <science, omens and visions, the truth or falsehood of this> will be discovered by the situation of Mars. Mars is in the 5th House, a productive house, in trine with Jupiter in the 9th House, but the reception of both is negative. By whole signs, Jupiter is in the 10th House and Mars in the 6th House, which would provide us with a link between disease, communication and the profession. Some questions remain to be answered: what is done of travel in the second and third part of life? And of the question of the father? On the other hand, the native was sickly and psychic all his life not only during the last part of it. Jupiter is in the house of Venus, so we can see the correlation between views, religion and omens, with the 2th House in the second part of life. However, certainly mediumship and gifts helped the native to survive throughout his whole adult life. Let’s refer to Alchabitius and verify what is contained in his book about the triplicities in Al-Andarzhagar. “1st House-Al-Andarzagar said in his Nativities, that the first lord of the triplicity of the ascendant indicates the life and the nature of the native and of the querist, his pleasures I and desire, what he likes and dislikes, and what he obtains of good and bad at the beginning of his life. The second lord of the triplicity indicates life, body, strength and the middle of life. The third lord of the triplicity indicates what the <first> two lords of the <place> indicate and the matter at death. 2nd House- Al-Andarzagar said :see which of the lords of the triplicity of the place of property-the first, the second or the third is stronger and better in its disposition and its place; then make it most deserving of the place of property and the indicator of adquiring property. If it is in the midheaven then it will come to him from authority; if it is in the place of religion, it will be more abundant. Similarly, the first lord of the triplicity gives property at the beginning of life, the second in the middle of it the third at its end. 3rd- Al­ Andarzagar said: the first lord of the triplicity of the place of brothers indicates older brothers, the second middle brothers the third younger brothers, and their conditions are according to the places of the <lords>. Here Bonatti made a mistake saying that the first lord refers to the younger brothers and the last one to the older brothers. 4th Al-Andarzagar said: the first lord of the triplicity of the place of fathers indicates fathers, the second countries and lands, the third outcomes of the matter and prison. 6th- Al-Andarzagar said: the first lord of the triplicity of the place of illness indicates illness and recovery afflictions, the second white and black slaves, and the third what he receives from them, their importance and their actions; it indicates riding and animals, and every four-footed animal, their sturdiness, whether they are many or few, and whether he keeps them or they run away; and prisons and confinements. 7th- Al-Andarzagar said: the first lord of the triplicity of the place of couples indicates women, the second controversies, and the third entering into covenants. 8th AI-Andarzagar said: the first lord of the triplicity of the place of death indicates death , the second indicates old matters, and the third, inheritances. 9th- Al-Andarzagar said that the first lord of the triplicity of the place of the journey Indicates the journey and its suitability, the second I religion and religious observance, the eminence <one obtains> in this, and the form <the eminence> takes, the third is the indicator of science, vision, stars (astrology), and omens and truth and falsehood in this. 10th- Al-Andarzagar said: the first lord of the triplicity of the place of authority I indicates governorship, honor and high rank, the second fame and bravery in that, the third its fixedness and continuity. 11th- Al-Andarzagar said: the first lord of the triplicity of the place of hope Indicates hope, the second friends and the third their usefulness. Well, here there is no sign of the division which gives to each third of life three fixed meanings relating to them. Finally, there is no relationship between the meaning of every lord of triplicity with a period of time. It is true that Andarzhagar provided to some houses three different meanings, but nothing indicates that they were restricted to a period of time. His thinking, at least as described by Alchabitius, seems very akin to medieval delineation. For example, with regard to the house of substance, he says: “see which of the lords of the triplicity of the place of property-the first, the second or the third is stronger and better in its disposition and its place; then make it most deserving of the place of property”, which shows that he was in tune with precepts that guide the whole medieval astrology, that is, the search for the planet that had the best conditions, the almuten of a particular subject. Mars is in the house of Mercury, which in turn is in the 3th House and between them there is a sextile with mutual reception. Bonatti here is assigned the younger brother to the first ruler of the triplicity.